It was my mum’s birthday last weekend so I decided to get the family all together for a spot of afternoon tea. 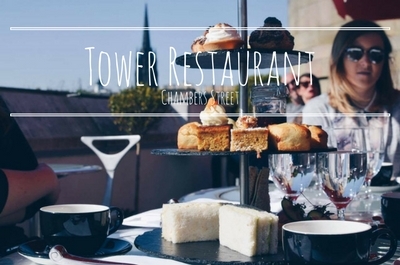 I decided to book a table at Tower Restaurant which sits at the top of the National Museum of Scotland, thus offering a fantastic view of the city. The weekend before had been pretty decent weather so I had my fingers crossed that we could make use of the restaurant’s terrace and we were in luck! 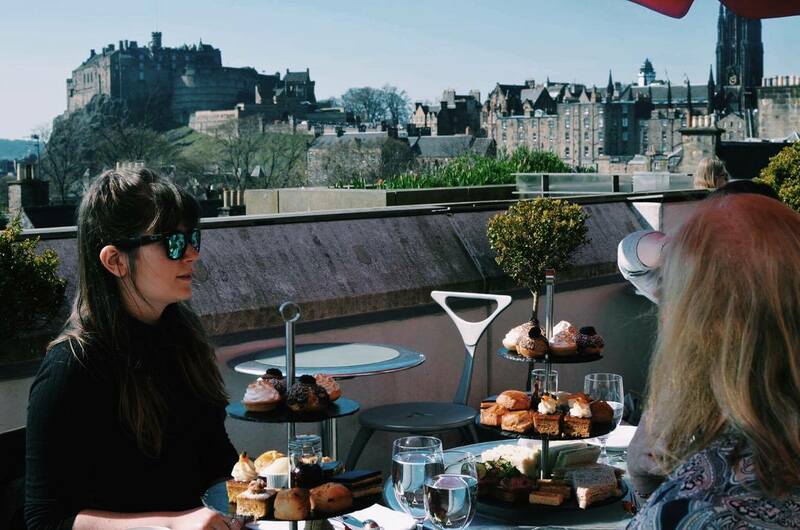 That being said whether the sun is shining or not (and let’s face it, it’s more often the latter in Scotland), this restaurant is the perfect spot for gorgeous views over our beautiful city of Edinburgh and the castle. The indoors restaurant features window-side tables and circular booths (ideal for larger parties) so everyone gets a great view out the huge glass windows. I’m definitely keen to come back to Tower Restaurant and sit indoors as well, but we could not miss the opportunity to soak up the sun (it is after all a pretty rare occurrence). The terrace is not as fancy in terms of décor as the interior of the restaurant, however, it definitely doesn’t get as much use as the indoors facilities so that is fair enough. It’s got a pretty cracking view and that’s all that really matters. It was quite difficult fitting all the afternoon tea cake stands, glasses, cutlery and cups of tea at the small outdoors tables, so I would say the outdoors is better equipped for a spot of lunch. The tables are quite small, but the waiters are happy to accommodate if you do want to sit outside. Our waitress was lovely, she was super friendly and patient with us despite the fact that we spent ages rearranging the tables so we could all get a spot in the sun (sorry about that guys ;)). The food overall was really delicious but I would say that the sweet treats were the highlight. Our cake stands were adorned with the usual sandwiches, cakes and scones. They asked if we had any dietary requirements before bringing in our food so they’ll likely accommodate for most intolerances and allergies. The scones are mini but you do get two each, and trust me with all the other treats on the plate you’ll be happy they’re mini, and they come with the standard strawberry jam and clotted cream. We also got little mini lemon meringues, chocolate choux (like a profiterole) topped with a blackberry, and mini carrot cake slices (topped with adorable fondant carrots). The sandwiches themselves were not, in my opinion, particularly unique or special, apart from one. There was an egg mayo which was nice, one with just cucumber and a ham and mustard (not a big fan of mustard personally) all on plain old white bread. The savoury highlight was a salmon and beetroot mousse on little toasts which was really tasty (and seems to have completely hid in the shade for my photo). Luckily for my mum and I, the rest of the clan are not fishy people so we ended up eating most of these. Overall though the selection would appeal to most palates and we were pretty full up in the end. The food and drinks at Tower Restaurant are a bit on the pricier side, but what we had to eat was definitely worth the price, especially with the added bonus of the location and views. 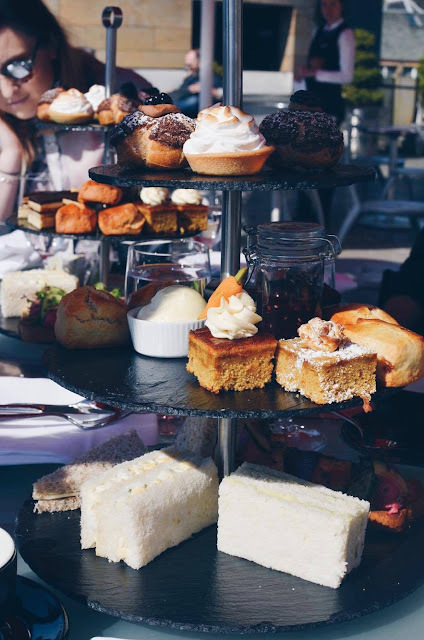 The price for the afternoon tea menu was £26 per person, which is pretty standard in Edinburgh. It bumps up to £35 for an added glass of champagne. We opted for a tea themed cocktail from the afternoon tea menu which was an added £7 per cocktail. I had a ‘G and Tea’ which was deliciously sweet gin-infused tea with grandine, cranberry and grapefruit juice. My sisters and mum all had ‘Green Tea Mojitos’, a classic with a tea twist. Overall this is a great little spot hidden above the museum (also worth wandering for a few hours for any tourists reading this), offering fantastic views over the city you’ll find hard to beat. I’m keen to try out their ordinary menu and indoor seating the next time I go. Their menu overall is on the pricier side, but this is definitely reflected in the food, décor and view. It would be the ideal place for a lunch break on a tour of the museum, but even if you're not interested in the museum it's a great find. I’d especially recommend Tower Restaurant for tourists as it offers a unique way to see the castle while enjoying a couple drinks and a lovely meal. For us locals, it's the kind of place to take someone for a treat, a birthday or event. Check out their website for yourself for details on their afternoon tea and main menu.